Abubakar Kori, a dwarf, who facilitated the suicide bombing activities of ‘Boko-Haram’ insurgents, said he was paid not less than N5, 000 for each suicide bomb attack carried out by the insurgents in Maiduguri. 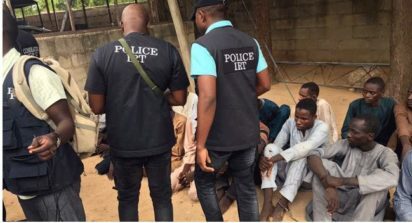 Boko Haram members arrested Kori, 25, is among the 22 people arrested by the police in Borno and Yobe for their alleged involvement in suicide bombing activities carried out by the insurgents. My role is to keep the Improvised Explosive Device (IEDs) for onward delivery to another person who will carry out the attack. “On different occasions, two of my acquaintances gave a parcel to keep for somebody, who will come and take it. “I normally kept the parcel in my duty post; the appointed person would come and pick it; after successful delivery, they paid me N5, 000. On two occasions, I was paid N200, 000 for the successful execution of bomb attacks. “Most of the time I had to pester them before payment could be made to me,” he said. When asked whether he had caused at any time to regret his actions, Ba’Adam said that he was never remorseful at any given time. Another suspect, Ibrahim Mala, 48, also admitted to aiding suicide bomb attacks in Maiduguri, sales of rustled animals and supply of logistics to the insurgents in the bush. Mala, a butcher, and resident of Dalori-Kakere village in the outskirts of Maiduguri revealed that the insurgents were supplying sheep and provided him with N180, 000 loans, to enable him to run his business. “They paid me N5, 000 for safekeeping of IEDs, and they also sent me on errands to buy consumable items for them. “I bought the items at the market and kept it at my home; some persons would come at night, pick and deliver same to members of the group hiding in the forest. “Some of the items included torch lights, matches, sandals, kola nuts, cubes and clothing materials. “I saved money in dealing with the group and bought a plot of land worth over N420, 000. “I know that they are Boko-Haram insurgents and my wife was not happy with my dealings with them; she asked me to stop but it is too late,” he narrated.